Robert C. McCoy of Sparta, Wisconsin came from a long lineage of military service. Grandson of Captain Bruce E. McCoy and son of Major General Robert B. McCoy (both namesakes of Wisconsin’s Fort McCoy), Robert C. grew up with a strong sense of duty to country, and service in the military was an unquestioned expectation. Having served with his father along the Mexican Border in 1916 and in France in World War I, Robert was accustomed to the life of a soldier in the field but also understood the significance of decorum and regulation, especially in the officer corps. By 1941, Robert had risen through the ranksfrom a Sergeant in the ammunition train to a Lieutenant Colonel in command of the 1st Battalion, 128th Infantry Regiment, 32nd Division. With his prior service and well known lineage in the Wisconsin National Guard, Lt. Col. McCoy was truly a “Real McCoy” as his men came to call him. In 1942, Colonel McCoy found himself leading his men in the jungles of New Guinea – a terrain and tactical situation they had not been prepared for. 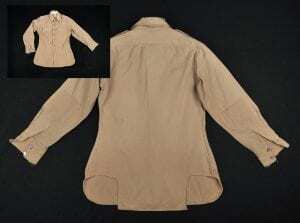 The Colonel’s shirt, held in the collections here at the museum, hints at the desperate situation the men of the 32nd Division found themselves in at their baptism of fire in the Battle of Buna, New Guinea. In the opening stages of the battle, the Battalion’s supply barge was sunk by the Japanese, taking the battalion’s baggage and equipment down with it. 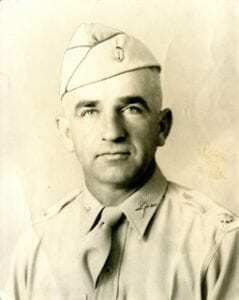 As the battle raged on for weeks longer than it was expected to, and with no other options and no hope of a supply shipment reaching them in the unforgiving jungle around Buna, Lt. Col. McCoy – a “spit and polished” battalion commander – was forced to cut pieces off the tail of his uniform shirt to make patches for holes in other, more visible places.